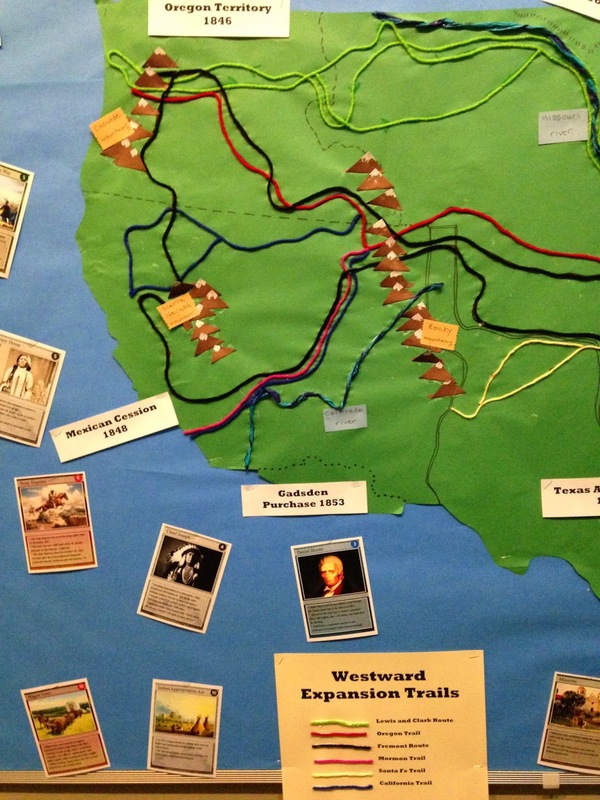 I purchased these awesome Westward Expansion Trading Cards from the Technology Integration Depot on Teachers Pay Teachers. Each card has a graphic and a short blurb of information, I am constantly finding kiddos standing in front of the board soaking up new facts. 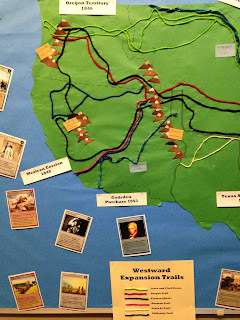 The trail routes on the Westward Expansion map were made using yarn (and lots of patience). The mountains are just little construction paper triangles with a dab of white paint to look like snow. Lastly, the rivers were made by twisting strips of blue tissue paper to make a sort of rope, the "rope" was then adhered to the map with glue. The best part of this whole display? I've now seen the fourth grade general education teacher bring her students to sit in front of the bulletin board two different times to enhance her lesson. Yaaay for library resources.